Puddles of Myself: Puddles of My Mad Men: "Mystery Date"
Quick question: is it just me or do the fonts on the internet look sharper and more amazing than usual today? Maybe it’s just me. In any event, I am here today to post the link to my latest Mad Men review over at The Montreal Review. I was stuck in holiday traffic coming back from New Jersey on Easter Sunday so I missed the initial airing of this fantastic and strange new episode of Mad Men and this my review was a bit delayed. 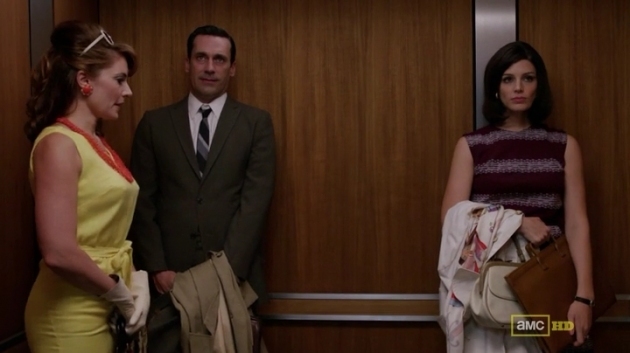 I’ve had a chance to rewatch the episode a few times now and I have to go on record as saying that it is perhaps simultaneously the darkest and funniest episode of Mad Men ever. I mentioned this last week, but the level at which the writing staff is operating using dialogue and other “in-jokes” based on our knowledge of the characters is astounding. The Roger and Peggy interactions this year have really hammered that point home. Roger and Peggy have hardly ever interacted in the show (go on, watch the film) but in three (OK, technically “four”) episodes, we have been given two substantial and meaningful Roger and Peggy scenes. This week’s was phenomenal with the dynamics of their conversation changing second to second: first jokey, then flirty, then serious (Roger commanding), then flirty, then serious (Peggy commanding). It was an absolute clinic. The other top winks/exemplary pieces of humor were the accordion player stepping up to Joan’s table after she finds out Greg chose to go back to Vietnam and the interactions between Michael Ginsberg and Don: first when Michael mistakes Don’s “I’ll see you later” to Meghan and answers back, “And I’ll see you later!”; and then after Michael impresses the Topaz men with his Cinderella pitch when Don lectures him about not ever doing something like that again. So far this season, in terms of knowing their characters and playing to the audience’s knowledge of the characters, Mad Men has firmly established that it is on equal footing with The Wire—and, at times, surpassing it. Overall, though, I was struck by how dark the episode was; how unsettled I felt as a viewer and how unsettled most of the characters seemed as well. The unifying themes of the show were all on display, but not in an easily “unifying” or recognizable way. It was more as if the themes were laid out, but you were given a different angle at which to look at them, which obscured their familiar shape. This made things more difficult to interpret or digest initially and, after I finished watching the episode, I was left puzzled as to what I should write about in my review or how I felt about it in general. However, I recovered—as I always do—and wrote about it. And you can read that full piece over at The Montreal Review.